You need to learn how to deadlift with proper form before anything else. So you want to start doing the greatest strength training exercise ever for your posterior chain – the deadlift. Meaning this one towering compound lift will target just about all the muscle groups on the back side of your body, and many on the front as well. Whether you use a lighter or heavier weight. So, do not worry about how much you can lift. First understand how to deadlift and increase the weight you lift – gradually. The result of moving up more than 5 pounds at a shot might be lower back pain and/or a groin pull. I know, I already made that mistake so you do not have to. Anyone who has ever experienced lower back pain knows you have to do everything possible to avoid it. And this is especially significant for those of us over 50. Your body will not recover as fast, so you have to avoid mistakes in order to keep working out without downtime. A gradual increase in weight avoids injuries. The more you understand about good deadlift form, the better your gains will be, and without injuries. You do not want to suffer with lower back pain, groin strain or even tennis elbow. If you want tennis elbow, then next time you deadlift, bounce those weights off the floor. Do not be surprised if you end up with the incredibly painful lateral epicondylitis, aka tennis elbow. Deadlift and bouncing heavy weights off the floor will do the trick. Your tendons need time to adjust to deadlifting. Even if you think you can deadlift heavier, don't. If you increase your deadlift weight only five pounds a week, that is 250 pounds in one year. 1. Set up your weight. Always start light for your warm up sets. Use a broom handle or weighted bar or olympic barbell to practice good deadlift form. 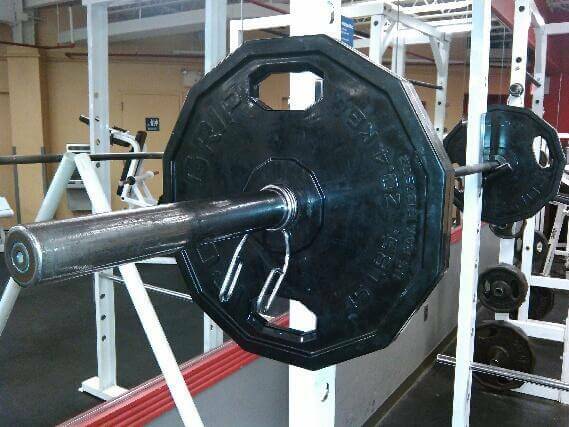 Or you can use 10 pound bumper plates to mimic the same height as if you were using 45 pound plates. You want to deadlift with the barbell at the appropriate height, and bumper plates are great for that. 2. Make sure the bar is perpendicular to your stance. 3. Also, make sure that you are wearing proper attire for deadlifting. When you are starting out, you do not need much, but do not shortchange yourself. You need deadlift shoes, as opposed to typical workout shoes. In addition, you want deadlift socks and maybe even long pants to prevent scraping your shins. My recommendation is the Nike Metcon 4 hard sole for deadlift shoes and Moxy deadlift socks. That is about all you need to start deadlifting safely. You can worry about a weight lifting belt when the weight you lift starts to climb. 4. Place your feet about hip width apart with the bar crossing over the middle of your foot. Use your shoelaces as the cue for middle of your foot. As opposed to the squat where your feet are shoulder width, you want your feet to be more narrow and a good cue is hip width. The reason for this is a big secret to effective deadlifting, using a jump stance to push against the floor to power the initial lift of the barbell off the floor. Don't ever deadlift the barbell using your back, instead, push against the floor with your feet and deadlift the barbell while keeping your back in a neutral spine position. 5. Place your hands on bar, You can use a double overhand grip for lighter weight so you can focus on perfecting your form. When the weight increases, you will probably pick an alternating grip to prevent the barbell from rotating out of your hands. Grab the bar in your hands, real tight and strong. No matter which grip you pick, there is no other exercise which will increase your grip strength like the deadlift. 6. Hip hinge and let your upper body drop towards the bar. lower your hips and make sure that your back is straight. 7. Do not even think about using your back to lift the weight. 8. Take a deep breath and tighten your core and entire body so that when you start your deadlift, you will have a stable core. As Tony Gentilcore says “lock your shoulder blades and put them in your back pocket” as a cue to help tighten your entire back. 9. Drive the weight off the floor with your legs, back straight, firm grip and when the bar passes your knees, push your hips forward to straighten up to use a full range of motion. 10. Lower the weight slowly and let it rest on the ground without bouncing or making a lot of noise and commotion and then reset and repeat the deadlift for eight repetitions in three sets. Rest 3 to 5 minutes between each set to recover. Work to perfect your deadlift form. Of course the same goes for the squat and every other exercise you do in or out of the gym. But, especially the deadlift, because of its risks and rewards, you must be fully focused on what you are doing. So what this means for you depends on where you are in your fitness of mind and body journey. I hope this proper deadlift form checklist is helpful as a tool, motivation and information. I welcome your comments and/or corrections. Thanks! Next: read this additional post how to ensure proper deadlift form with the 5 point deadlift setup. Check it out here. Please share your recommendations on how to deadlift with proper form.